Do I even need to remind you how amazing fried cheese is? And specifically how wonderful this Buffalo Fried Cheese Curds recipe is? I don’t–but I do because #SEO. So let’s take a moment to pay tribute to all that is good in this world, and deep fried, and covered in buffalo sauce. I based this Buffalo Fried Cheese Curds recipe off of the legendary appetizer at Murray’s Cheese Bar in NYC. If you’re not familiar, they literally wrote the book on how eat and pair cheese. While it’s common to see deep fried cheese curds in the Midwest, it’s not too common in the Northeast, so adding the Buffalo sauce brings this dish full circle. Note to self: let’s deep-fry a garbage plate next. I made some cheese curds from scratch using this tutorial. Besides a honking gallon of milk, you’ll need calcium chloride, thermophilic culture C-201, rennet and a couple of hours to kill. Otherwise, you can just cut to the chase pick up some cheese curds at any market–I won’t cheese shame you. Easy Midwestern Buffalo Fried Cheese Curds Recipe as inspired by Murray’s Cheese Bar in NYC. Make cheese curds. Either purchase 1 pound of cheese curds and wait for them to come to room temperature OR make your own curds from scratch (Instructions here). Fry cheese curds. In a deep pot or skillet, pour 1-2 inches of vegetable oil and heat to 425 degrees F. I like to use a laser thermometer to check frying temperatures. In a medium bowl, sift together flour, baking powder and salt. Stir in the eggs and milk. Mix or whisk until smooth, adding extra milk to achieve your desired consistency. Dip a handful of curds in the batter and carefully put in frying skillet. Fry dipped curds for ~1 minute, or until golden. Remove curds from frying skillet and place on paper towels to absorb extra oil. Make sauce. Slowly heat sauce ingredients (butter, hot sauce, white vinegar, cayenne pepper, garlic powder, salt) in a sauce pan on low heat. Whisk while heating. Once sauce begins to simmer, transfer to separate bowl and continue to whisk. Place fried curds in a separate bowl and pour buffalo sauce over. Toss to coat. 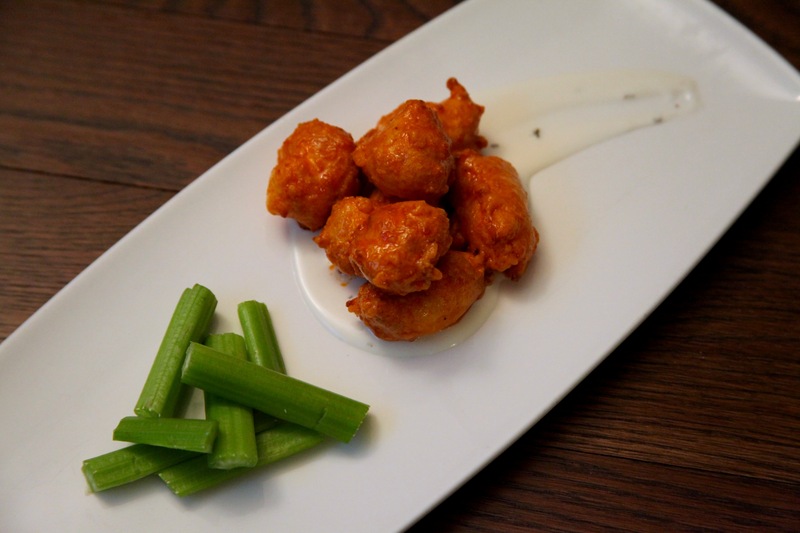 Serve hot buffalo fried cheese curds with celery and blue cheese / ranch dressing. Made buffalo fried cheese curds at home? Tag your photos with #PateSmith or share them in the comments for the chance to be featured onsite! This recipe is Murray’s Cheese Bar approved.